With the Godbomb story over, in all three times, Thor returns to earth. We see a glimpse of young Thor with the ancient Norse people, enjoying the simplicity of life on Midgard. And we see old Thor returning to Midgard as well, which has become a desolate wasteland. Most of the story, however, is taken up with present-day Thor, who visits old friends and makes some new ones as he spends time with mortals. He visits a man on death row, an old barkeep friend, soldiers and sailors, and a monk in Tibet. He joins SHIELD agent Roz Solomon for her graduation party (she invited him on the internet, and Tony Stark recommended that he go). And he spends time with ex-girlfriend Jane Foster, who is now battling cancer. At the end of the story, Thor finds Roz in the Arctic dealing with environmental damage, and offers to help. This is a classic "recovery" issue the like of which we used to see in the old days, but which most comic-book series don't produce anymore. After a gut-wrenching 11-issue pair of opening story arcs, writer Jason Aaron wisely gives both Thor and the readers a break from the action, and provides us with some depth, some character development, and some quiet time for Thor. The series of vignettes is extremely well-done, each revealing a small aspect of Thor's character. One of the most touching scenes is the one with Fulton, the death row inmate, whom Thor brings a rare, extinct fruit for his last meal. Thor then accompanies the man into the execution room with a hand on his shoulder, pledging to be there until the end. This scene was truly moving, and proves that comic-books can have the depth and emotional impact of any other medium. But Aaron was not done there. 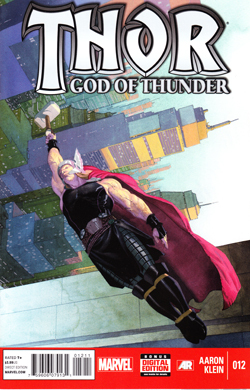 The middle part of the book contains the longest vignette, featuring Thor and Jane Foster. We learn that Jane is battling breast cancer, and undergoing chemo. She wears a kerchief on her head, presumably because she has lost all her hair from the treatment. Thor offers to provide magic or wizards, but Jane refuses, saying that as a doctor, she wants to rely on medical science, and if that fails her, then to die with dignity. Thor's pain over her plight is touching, as he complains about how useless it is to be a god if you can't pull off miracles to save those you love. He ends by taking Jane to the "Blue Area" of the Moon -- which in Marvel canon has sufficient oxygen and air pressure for people to survive without a protective suit. There they watch the sun set behind the earth. This scene was touching, both sad and uplifting at the same time. I have never read about Jane Foster in any Thor comics (Walt Simonson did not use her in his 45-issue run), but in a handful of pages, Aaron made me care about her. Despite the seriousness of most vignettes in this issue, Aaron manages to weave in lots of humor. When Thor asks Jane if he could summon just one biomancer to help her, she threatens to go out with Hercules, to which he responds, "Thou wouldst not dare." I chuckled at this, even though it is coming on the heels of a very sad scene about Jane's illness and her mortality. There are also other little jokes, such as when Roz dances with Thor and remarks, "Oh my God," to which Thor, being a Norse god, says, "Pardon?" -- clearly thinking she's addressing him. The deftness with which Aaron pivots from funny to sad, to mysterious (with the dying whales) is amazing. Indeed, this issue stands as a shining example of how to create depth in a comic-book. It's one of the most satisfying stories I've read in this new generation of comics, and shows that Aaron is a worthy successor who can be compared favorably to the defining author of Thor -- Walt Simonson. He's got a way to go before he can be considered Walt's equal, but he's definitely a fitting heir to the throne of Asgard. The only negative about this book is the artwork, which is simply mediocre. Klein gets the job done, but his work suffers badly in comparison to the first 11 issues by Ribic. I had to dock this issue a point for that. Hopefully the next artist will turn in better work. Still, this issue was outstanding otherwise.